Just so you know, these things are where you'll get to hear the infamous Haru laugh. It made me happy cry and added 18 years to my life. So, the music and art for these are as good as the main series (minus the openings and endings, obviously). These aren't exactly bloopers, but more like a bunch of mini OVAs. Basically, you're getting like a two and a half minute story involving the five boys from Free! Most of them are simply funny, like one involves Makoto and Nagisa experimenting to figure out just how much water it would take for Haru to start stripping. The one about Haru's laughter is heartwarming. A couple of them do actually add a bit to the story, though not much, and I think one of them ties into the Drama CDs (which are also super cute and funny, by the way). 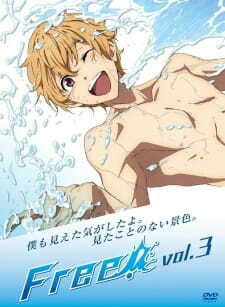 For example, one of them will show you why Rei wore the speedo he had on during the first day of practice at Iwatobi. Naturally, these are just sort stories so you don't get character development or plot development, but you'll get a few good laughs, and maybe you'll even cry. If you want to hang out with these lovely characters some more, definitely watch these. These shorts take what is in my opinion the best part of Free!, stories of friends getting along, being silly and enjoying each other, and presents it in adorable shorts that are fun to watch! If you're missing Free! and you need a fix, watch these, they're fun and adorable and will cheer you up if you're feeling down. You WILL hear Haru laugh and it WILL melt your soul! This is my first time writing a review so *whispers* please be gentle. Haha. It contains plots which aren't heavy at all and it is pretty entertaining. I even laughed at certain parts. Plus, it shows how the characters live casually. Its art quality is completely the same as the main story: fluid animation and nicely colored. For the sound: Even though you will only hear it in intros, the music has an aura that gets you hyped. Since it isn't displayed that much, I only considered it good. The characters' personalities were enhanced and there were some new discoveries from these. For all the fans out there, I guarantee that you will enjoy it but don't expect some heavy plots from them because- hey- it's just a short.